Methoda’s experience in many organizations proves that a professional and orderly testing system is a prerequisite for the quality of service and products, compliance with standards and binding regulations, and promotes customer satisfaction. Testing management is an integral part of quality management and accompanies all of the lifecycle stages of the project. The manner in which the project is managed and its development methodology (Agile, classical development, DevOps, etc.) affect the testing process and management. Success is dependent on a number of dimensions: adherence to the specifications, on-time delivery, delivery within the budget, and most of all, customer satisfaction. An effective testing management system directly contributes to all of these dimensions. to integrate broader issues that are related to testing, such as configuration management, error management, transfer to production, project management, etc. to train, mentor, and provide workshops that are suitable to the work methods of the organization. Methoda's experts are familiar with many organization and have accrued extensive experience. Methoda provides the type of consulting most suited to your organization. 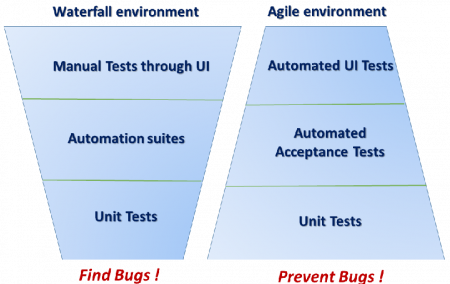 Methoda is experienced at defining testing processes and teams for Agile, DevOps, classical development, and other methodologies.